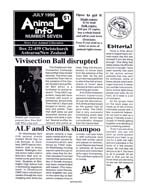 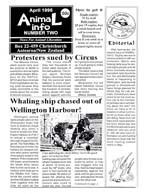 Animal Info was a thin, photocopied newsletter that was published with the hopes of increasing the militancy of New Zealand’s animal activists. 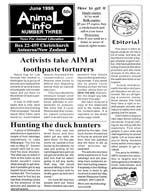 It’s pages contained news relevant to local campaigns, alongside the home addresses and phone numbers of various animal abusers. 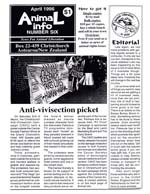 The zine’s rhetoric was, at times, over the top and even once racially insensitive. 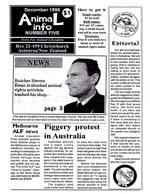 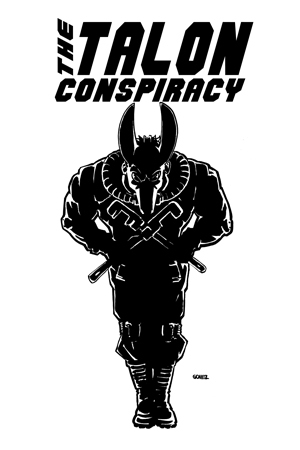 Issue #1 contains an N-bomb on the front page that was seemingly intended to make an anti-racist / speciesist point, but instead has the exact opposite effect. 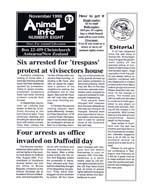 Still, Animal Info is an inspiring example of committed activists organizing on a grassroots level and agitating for greater commitment in the struggle against speciesism. 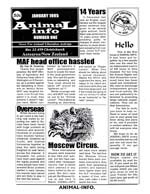 It’s international news coverage was impressive given the magazines small number of pages, and nicely bridges the U.S. coverage lapse between the time Open the Cages stopped publication and No Compromise began. 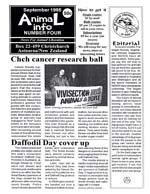 All of us at CG would love to see this type of paper return to regional organizing in the United States and abroad.